And what a workout! It was an amazingly fun and sweaty workout, but parts of it were SO hard. I did okay with everything but the standing up parts. My quads would burn like they were on fire and it would make my knee start to ache. For those of you who may not know, I had a right knee injury in 2003 and arthroscopic knee surgery in 2005. I was working as a horse wrangler at a summer camp in Yosemite (hard job I know!) and the horse I was jumping tripped and fell on me during our final jump. The impact split open my knee to the bone and a two-hour ambulance ride, x-rays, two doses of morphine and 20 stitches later, I had the makings of a wonderful scar. Unfortunately either the ER doctor didn’t sew it up correctly or something else went wrong because it never healed correctly. The ER doctor told me that I hadn’t hurt any of the tendons or major muscles so I should be fine. Well, after having lots of pain for two years, a steroid shot in the knee (that was painful) and several visits with an orthopedic surgeon I elected to have arthroscopic surgery.The surgeon didn’t exactly know what was going on until he actually went in, and then he found and cleaned up scar tissue that was rubbing on the bone and muscles causing the pain. 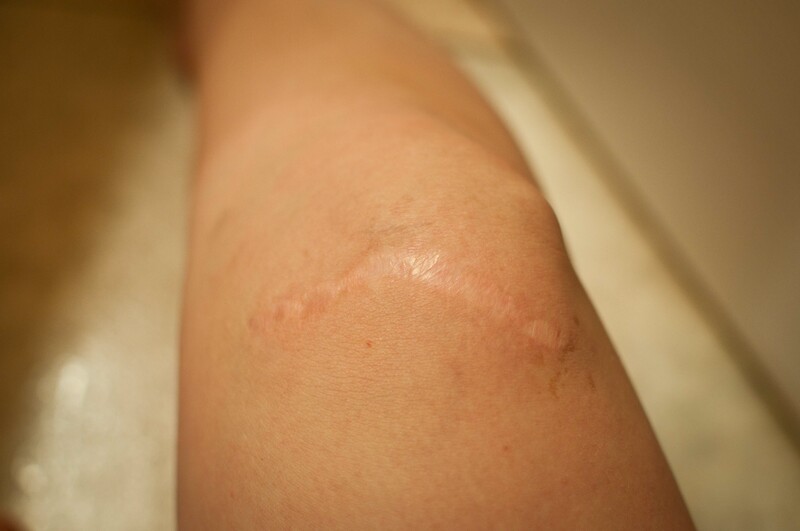 He also re-did my scar for me to make it smaller and less lumpy (it looks a million times better now!). It does really well now except when I try to do too much too fast. I am especially surprised that I have been able to run at all! My knee will definitely let me know if I am running too far too soon, and it was talking to me last night during those standing parts of spin class. So I did as much as possible before it started to get painful and then backed off the intensity and sat back down on the seat. I think from now on I will go to spin once a week and not push too hard; trying to give my knee a chance to build up slowly.